Physical Astronomy by Daniel Cummings. Most people, when they look up at the night sky can easily see stars and identify some familiar groups of stars (asterisms and constellations). Some people can even find and name some planets – Venus, Jupiter, and Mars are all bright and easy to see. But, there are many invisible wonders in the sky – and some of them can be seen without a telescope. In fact they are so big that a telescope is not the right tool to use; we have to use something even more powerful… imagination! Using visualization and imagination, I am going to show you how to find and “see” a very large structure in our sky: the solar system disk itself. Through this exercise you will learn to identify planets and use them to trace out and see the solar system disk in the sky. You will learn to imagine the orbit trails of Venus and Earth and the Moon as if they were visible. You will follow Jupiter’s 12 year journey across the constellations. And when planets are “lined up next to each other” you will be able to understand and visualize the deep space distances between them. The solar system is a disk. We can learn to see it, luminous, ancient, traveling. We are a part of that disk, always moving inside it. From our point of view on Earth, the disk of the solar system is always visible as a line in the sky – if you know how to see it. The bright planet Venus will be our first guidepost. Venus is easy to find because it is the brightest object in the sky after the Sun and the Moon. It’s the first object that becomes visible as we move into night. Yes or No… can we see Venus at midnight? Think about it for a minute. I’ll give you the answer a few sentences from here. When do you normally see Venus in the sky? At night, right? But, for how long into the night does it remain visible? Does it stay up in the night sky until midnight? The answer is no, we can’t see Venus at midnight. The reason is because Venus is too close to the Sun. It will never appear in the middle of the night sky. At midnight, the part of the Earth that we are on has fully turned away from the Sun, we are looking into space in the opposite direction from the Sun, and we experience night. Night is when the Earth blocks our view of the Sun and it will block our view of Venus too. Here is a drawing showing the orbits of Venus and Mercury just after sunset. It is not to scale. However, it shows how the two orbits are fully visible to people on earth. There are no lines in the real sky showing the orbits, but you can easily imagine them after seeing an image like this. In fact, if you want to see a version of this image showing the way the real planets are arranged, you can grab a copy of Stellarium. You can set Stellarium to show you the planet orbit trails. 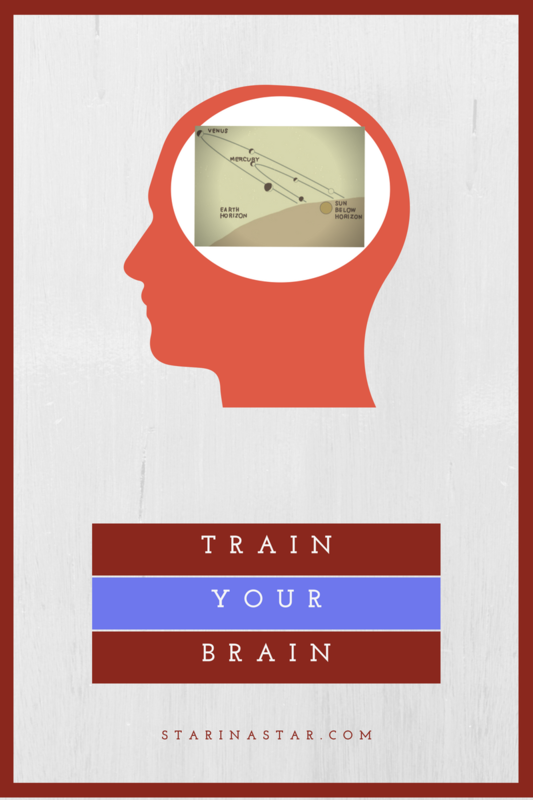 You can also learn to see the orbital path followed by earth. 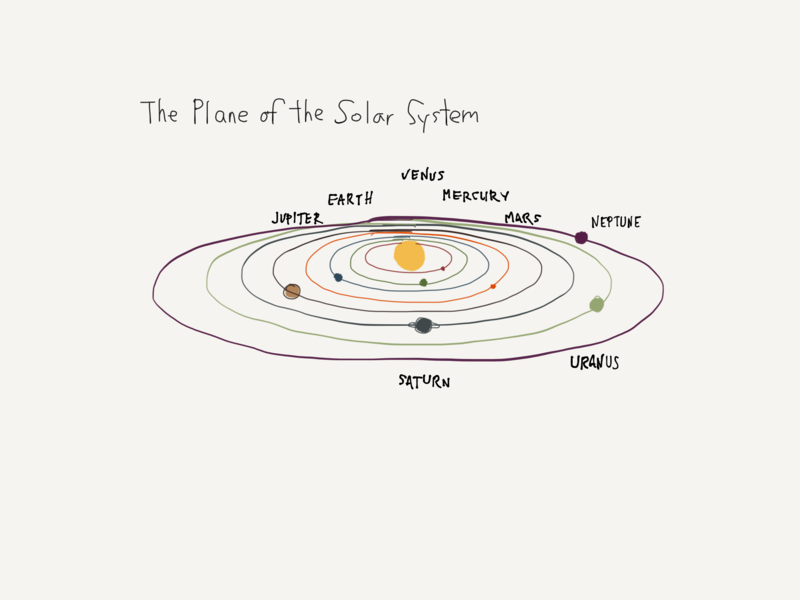 This is another way to begin to see the solar system in the sky. Let’s start with another question and answer. 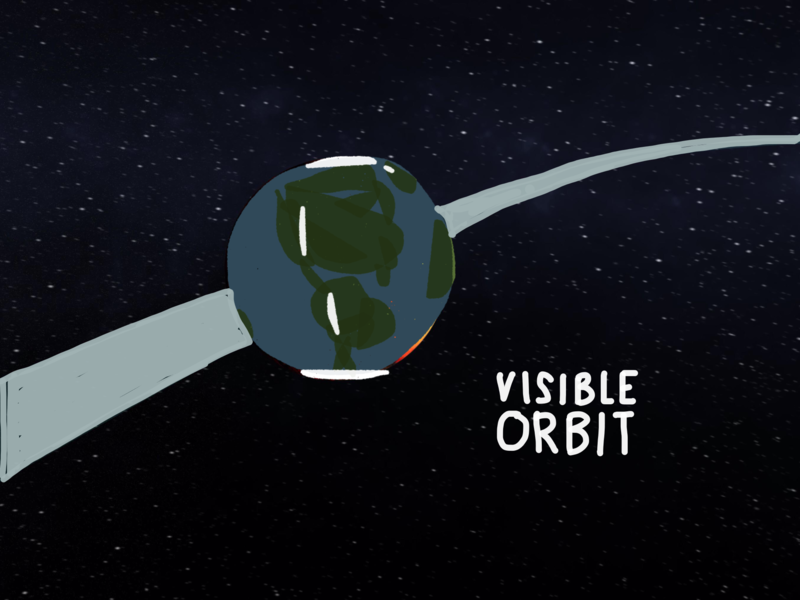 Imagine if you could look up in the sky and see the orbit trail of the Earth. As if the Earth’s path through space were marked by sparkly, glowing dust! Where would you look? Would the orbit trail appear to be near the Sun and appear during the day? Or would it be visible at night? If night, what time of night? I am going to teach you a trick that uses the moon to help you “see” the Earth’s orbit. 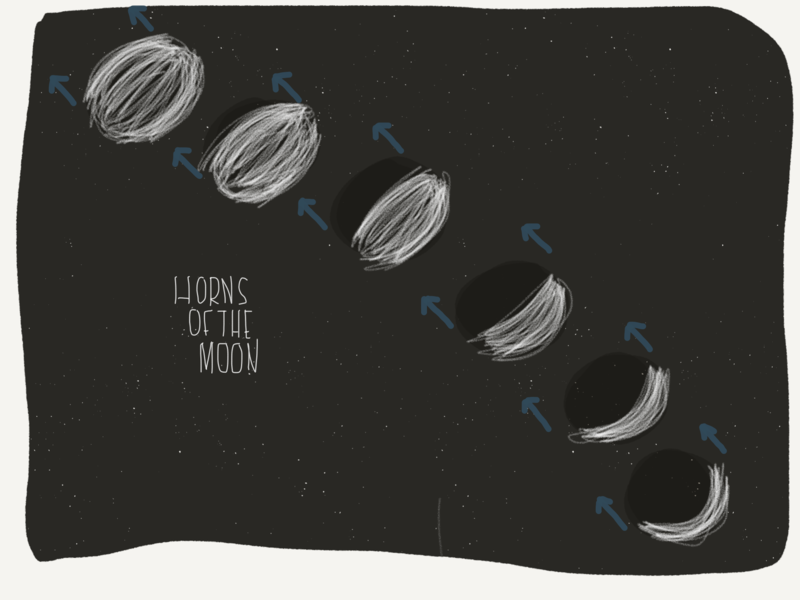 The trick is to find the moon at its quarter (so-called half moon) phases. The moon in these 2 phases shows you where the earth’s orbital path would be if it were visible. There are two points in every moon cycle where the moon’s orbit crosses the orbit of the Earth: the 1st and 3rd quarter moons. At sunset at the 1st quarter moon and at sunrise at the 3rd quarter moon, the moon, the sun, and you are oriented in a way that makes it easy to “see” the Earth’s orbit. When you look up at the moon you are seeing where the earth was (1st quarter) and where the Earth will be (3rd quarter). It’s a really incredible, dizzying feeling to look up at the moon and realize that it shows you where the Earth’s orbit is… especially during the 3rd quarter moon where the moon is like the tip of an arrow flying through space ahead of Earth on its orbit. The moon gives us another guidepost in this exercise – it can help us to see the solar system. As it moves through the sky and goes through phases, it always “points” towards the Sun. First, another question: You know that the moon orbits the Earth, but which direction and by how much does the moon move in the sky each day? Think about it for a few seconds now… does the moon move north to south or east to west or west to east or south to north or some combination? Does it change direction or always move in the same direction? The answer is that the moon moves toward the dawn. Its orbit around Earth makes it appear to move eastward through the sky. Also, the Moon changes shape as it orbits the Earth. At the crescent phase the Moon has “horns” and these horns are like pointers that help you visualize the plane of the moon’s orbit and also the solar system. 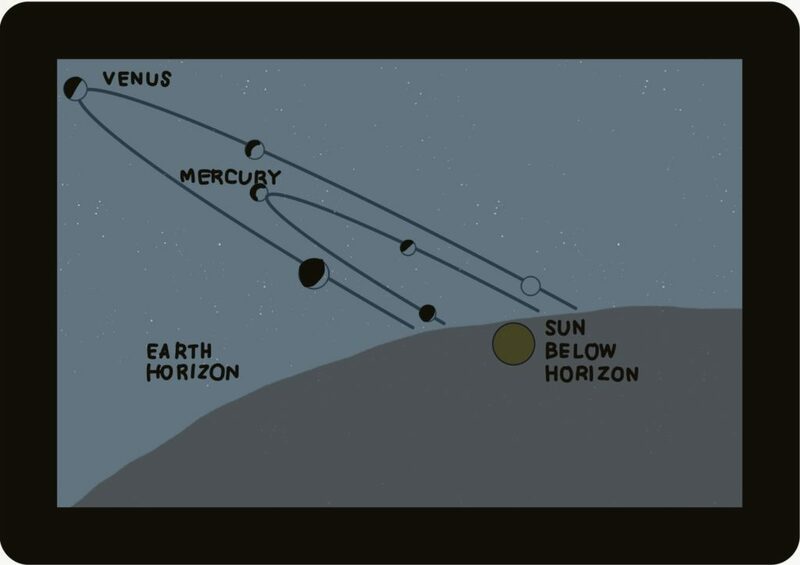 The moon’s orbit is roughly aligned with the solar system disk and the ecliptic (the path the Sun appears to travel through the sky each day). So, if you can see the direction and orbit of the Moon, then you can come pretty close to the ecliptic and from there see the entire plane of the solar system. Jupiter takes 12 years to travel around the Sun. From the Earth, over the course of 12 years, Jupiter appears to move slowly through all of the sky. Year by year it moves from one constellation to the next – always eastward toward the dawn. Right now, in early 2017 Jupiter is “in” the constellation Virgo. But, next year this time (March 2018) it will have moved “into” the constellation “Libra.” It will eventually cross all of the Zodiacal constellations, Scorpio, Sagittarius, Capricorn, etc… in a stately 12 year cycle. When you look at bright Jupiter you are seeing an object that is between 588 million to 968 million kilometers away. Light itself takes between 34-54 minutes to travel from Jupiter to Earth. Sometimes the planets are “lined up” in the sky, with Venus seemingly “next to” Jupiter or Mars. This is the perfect time to look up at the planets and contemplate the fact that they only appear to be lined up because one is in front of the other from our point of view – it’s like the more distant planet is “photobombing” the other’s picture by appearing in the distant background. These visualization techniques can help you see the solar system. You can use these tricks day or night. The Sun is the center of the solar system so when you look at the sun you are looking at the hub of a vast and knowable structure. I use these imagination tricks to stretch my vision of what is “up there” and to help me see the great geometries of space. Please share your experiences and comments below. This is really interesting! I like how you provided a few different ways to see the shape of the solar system. Next PostNext Quiz – Do you Moon Phase?